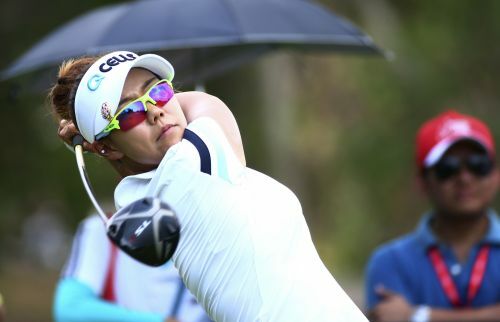 CHONBURI, Thailand (AP) — South Korean golfer Jenny Shin snatched the lead at the LPGA Thailand with a birdie on the last hole of the second round at Siam Country Club Pattaya on Friday. Shin bogeyed the sixth hole but sunk five birdies in the rest of the round, including the par-5 18th. Her round of 4-under 68 put her at 11 under overall and one shot ahead of the field. Three players were tied for second: Lizette Salas of the United States (68), Minjee Lee of Australia (69), and first-round leader Eun-Hee Ji of South Korea (71). Shin said she was feeling the heat and thought she could have played better. "I wasn't hydrated enough this morning and I could feel it by late afternoon," she said. "I could have made a few more putts. I will try to make sure I'm hydrated more tomorrow." Salas said she was seeing the benefit of spending more time in the gym in the offseason. "I'm not a rookie anymore, I'm a vet, so it's time to get serious," Salas said. "I've found I can be more aggressive with the driving game and things are starting to pay off." Lee could have finished as co-leader but a poor approach shot on her last hole slipped off the green and she finished with a bogey. Two-time champion Amy Yang fired a 6-under 66 to be two shots off the lead in a tie for fifth with Americans Austin Ernst (66) and Amy Olson (67). Moriya Jutanugarn set herself again as a strong local contender after her 68 lifted her into a share of ninth place with Carlota Ciganda of Spain, Katherine Kirk of Australia, and Ryann O'Toole of the U.S. They were four shots behind. Moriya tied for second last year. Her top-ranked sister Ariya dropped to 4 under after a par 72 including consecutive double bogeys.